I hear it all the time from my clients when we are tapping together. We’ll finish a round of tapping and they will report that while we are tapping their critical voice is saying the exact opposite to our tapping phrases. 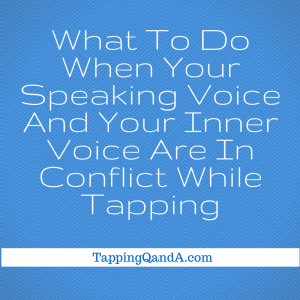 I know how frustrating this can feel, but in reality it is one of the best outcomes to happen when you are tapping. That seems counterintuitive, but it is quite true! Listen here to see why and how you can leverage this to get more out of your tapping.